Sixteen-year old Anna Sullivan is having terrible dreams of a massacre at her school. Anna’s father is a mentally unstable veteran, her mother vanished when Anna was five, and Anna might just chalk the dreams up to a reflection of her crazy waking life — except that Tyler Marsh, the most popular guy at the school and Anna’s secret crush, is having the exact same dream. Despite the gulf between them in social status, Anna and Tyler connect, first in the dream and then in reality. 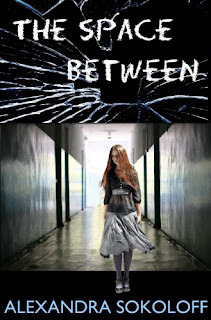 As the dreams reveal more, with clues from the school social structure, quantum physics, probability, and Anna's own past, Anna becomes convinced that they are being shown the future so they can prevent the shooting… If they can survive the shooter — and the dream Based on the short story "The Edge of Seventeen," winner of the ITW Thriller award. The Space Between is a very different book than what I'm used to reading. It is very dark and strange and really makes you take a second look at the people around you. The main character, Anna, is having dreams of a shooting at her school, but these images are way too real to be just a dream. Anna must work with her crush, Tyler, to figure out what's going on before the massacre happens. I think Anna's character is really unique. If you read a lot of YA paranormal, like i do, you are used to very strong females who go out looking for dangerous people, but in this novel it is a scared, innocent high schooler who must figure out who the person in her dreams is that is killing all her classmates before it happens. This is such a dark subject and very hard to think about yourself being in that situation. You have your main character as this girl who is absolutely terrified of the situation and the way that Alexandra Sokoloff describes her is as if she is sitting right next to you. You can literally feel all of her emotions when she does. And the way that Alexandra Sokoloff describes the settings in the dreams is so vivid that you really do get scared. I know that this is a dark subject, and maybe also a little taboo to talk about, because its such a horrible thing to happen, but i really appreciate that Sokoloff went all out for it. She didn't try to make it PG or tone down the violence. She described it how it really was, and yes it wasn't too bad because it is a supernatural thriller so you still had elements of things not being "real" so it kind of helped you cope, but she didn't try to clean it up. I really like that, because i wanted to be scared and feel those emotions that Anna was feeling. I didn't want to read the book with a smile on my face and say "everything is going to be great in the end =D". I still wished for that ending, but not because the story line made it seem that way. And the ending was completely unexpected so i really liked that i couldn't have guessed that one happening. Even though i did like it there were still somethings that i didn't. Since it was a supernatural i did get a little confused here and there, especially with the possible outcomes equation that kept being repeated. I get the meaning behind it and the significance, but i was confused until the part came where the reader understood WHAT exactly it meant. I also think the parts about her mom were a little confusing as to what exactly happened, but i still think it was a good part of the story. I think i just dont know if this subject is for me. I did really like it, but its just not the genre that i turn to when looking for a book. Great story, just not my first pick. This is a really good book. It is on a very dark subject and i think that instead of tip-toeing around the subject that Alexandra Sokoloff did a great job with just putting it out there with all its gore-y details. I think she did an excellent job on Anna's character. I felt everything that she felt and was a little surprised by her character, because most of us are used to strong, brave characters and not the innocent, terrified character and Anna was. Her being this way wasn't bad though, it made it feel that much more real, because that is real emotion for this situation. It did get confusing at times though, which kind of had me lost for awhile, but in the end i was shocked by the ending and satisfied with the story. I did like this book, but its subject/genre is not the first thing i would turn to look at when looking for a new book. I do recommend you read it, because it is a very different YA novel and i think everyone should get a bit of dark reality in their minds sometimes. Becky, I'm thrilled that you responded to the book as you did, especially when it's not really your kind of book. I appreciate that you stayed with it even though it is so dark, and that you empathized with Anna so closely. It's a harsher thing but far more realistic, as you say, to have a sixteen-year old girl be truly frightened in what would be an ultimately terrifying situation - and yet still have the courage to act and try to do the right thing. Thanks so much for reading! Thanks so much for the opportunity to read it. Hope you have an amazing new year! !